Matt Doughty and his small independent operation Onell Design produce the Glyos System series of toys, a hybrid of building toy and action figure. Doughty also produces a great amount of inspiration for toy collectors and builders around the world. In his Glyos Transmission Web Log, Matt features his Glyos creations artully photographed in creative configurations and with what I consider to be deeply immersive background sets. Whether with buildings constructed from his vinyl Block toys or in the picturesque Massachusetts outdoors or in caverns of flowing urethane or within the masterpiece of a dingy metal 'holding cell' that he used as a background for years, Matt has created and shown his toys in a beautiful world that is well in-tune with the aesthetic of his figures- an aesthetic that calls back on classic toys and video games of the past but also ventures in new directions of its own. I feel rewarded to have collected Glyos for a few years now, and I often feel inspired to create my own slices of the Glyos universe. 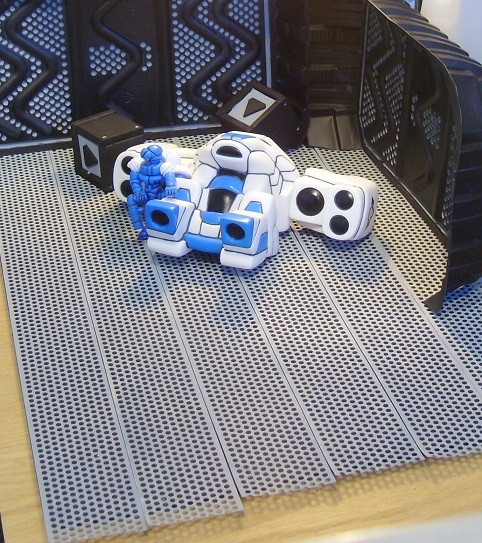 In 2011 I constructed a simple hangar set for a Glyan figure and his White Skull Division Rig (Blue Version). Here are a couple photos of this. My use of scrap material is plainly evident. 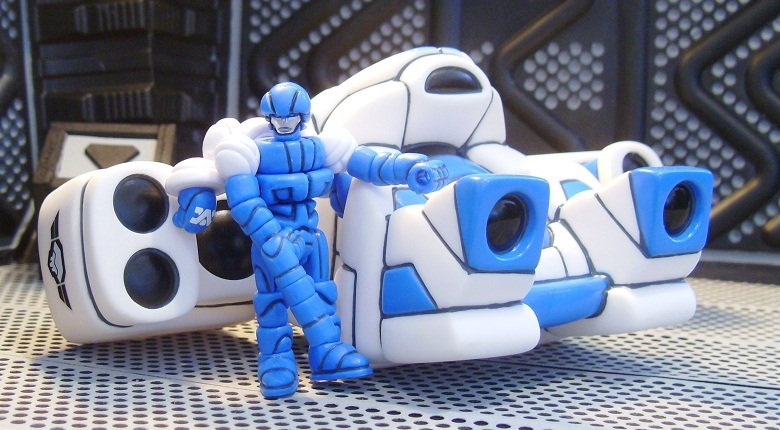 I cannot possibly recommend a toy more strongly than I can recommend Glyos. The product and price are both outstanding and the people behind it are brilliantly talented and a pleasure to deal with. Thank you, Matt and Michelle. My name is J.C. I have always enjoyed creation of and immersion into worlds of play. I have spent many an hour roaming through zones, stages, levels and maps of video games. Tabletop games have often held my interest, whether writing and illustrating the settings of role-playing games or building the terrain maps of tactical war games.. As a toy collector, it is a simple and rewarding pleasure to build displays and see the world from a toy's scale. Zone Stage Level is a log to share my creations and ideas on the subject of world building. Please enjoy. My first experience in war gaming was in 1997, when friends and I took up the Epic scale version of Warhammer 40,000. For weeks we labored with love in converting a 3' x 6' folding table into a world for war painted and sculpted with hills, forests, rivers, roads, mountains and ruins. It was no doubt amateurish compared the work of experienced gaming terrain builders, but we were very proud of the small world we created while blasting questionable metal such as Yngwie Malmsteen and Type O Negative from the 5-disc CD changer. We had a great deal of fun in building, even if Games Workshop's game itself was very disappointing. In 2010 I considered playing tactical war games again. Or perhaps I had a creative itch to scratch, for I decided to try my hand in terrain building once more. I considered different war games for modern warfare. In the end I never played any of these games, but I had fun again building simple hills for display. Here are some 1:72 scale military toys and a pair of hills that I made. Lego is my favorite toy of all time. My childhood passed through the "Legoland" era of Black Falcons and Futuron, and with a small collection of small sets I spent hours on the floor building small slices of Lego minifig life or large sprawling cities with buildings the scale of single bricks. Years later with the improved resources of adult life and internet purchasing, I had a chance to build again. A friend and I put together a fantasy adventure dungeon scene in September 2008. Here is a photo of that dungeon maze- and my friend's little dog too. Conventional and popular scale modeling that is used to build table top game terrain often features intense sculpting and painting of fine details to create an image of a world in miniature. In contrast, Lego has a video game-like quality of "blocky resolution." Video games of decades past needed to rely on clever re-use of building blocks of sprites to construct their levels, and I feel that the medium of Lego can portray that spriteworld quality. A table top world builder has a choice of what "resolution" to work at, and a choice of the impression they wish to create.